It seems like I’ve been making this game forever. I’ve restarted making it completely from scratch on at least two occasions and I have certainly learned a lot in the process. But now more then ever I’m considering myself done with it. You shouldn’t expect any further updates. Here is version 1.0 of They Do Not Die. You can now save your game. You can obviously also load that game save and continue playing from where you left off. shooting now consumes energy (just enough to stop it from regenerating). Health regenerates at half speed when you aren’t full on energy. I’ve removed the on screen frame rate counter. The music no longer plays improperly slow in the Wii version. The performance has improved in the Windows version. The background music is as always by RekcahDam. I had planned to include user submitted levels. But with only one entry so far I’ve decided against it. If you want to play that one level then you can find it here. 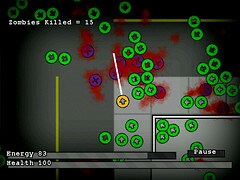 It is titled Zombie Death Maze and was made by Mr. Reaper. You can also find Mr. Reaper’s reskin for the game here. Awesome. My zombie game is on hold. I ran into 1 bug and I have never been able to figure it out. Someday I will pick it up again. I’ve been too busy with web design. If you would like me to I would be happy to take a look at it and try to help you work out the bug. Oh, that would be cool, though it being the 2nd thing I have ever programmed and being in collaboration with a friend who doesn’t even know how to program, it probably breaks every rule of code cleanliness. It displays 1 less zombie than expected leaving the player and 1 zombie after everything on screen has been killed. Prevents rounds from progressing. 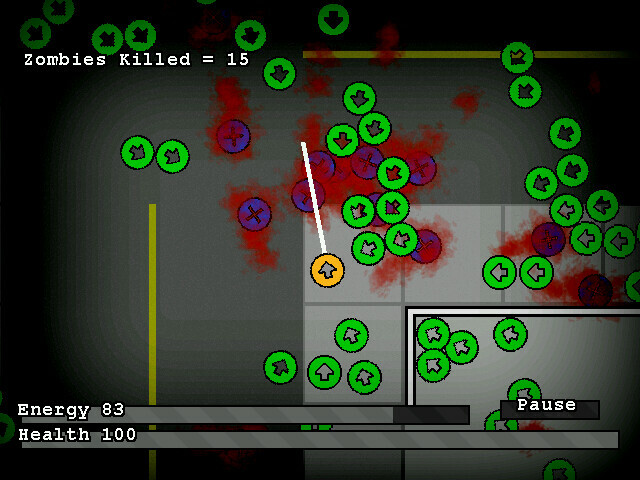 I could use a workaround like making rounds progress when 1 zombie is alive but I’d rather not do that. I checked most if not all my loops multiple times. Sorry for the mess, thanks for the help! I think its line 398. you should not be doing a x– in that kinda loop better to just let it continue. I try to help you improve this game, and you continually snub me by not including my enhancements, even though it would be ridiculously simple to do so. I made you some cool custom graphics long ago, and you never bother to put them in the game, not even as an alternate option…. Because you like your circle graphics, even though you’re the only one who does. You ask for maps, and I think, “ok, sure, I’ll help him out,” because I think this game has potential…. And then you decide not to even bother including that. I’m not surprised that nobody else made any maps. Why? Because there would be no point in it — one map is the same as any other map when there is absolutely no goal to the game other than “shoot zombies until you get tired and turn off the game.” I made suggestions about that long ago (they are still on the wiibrew page). I told you that there needed to be some kind of simple goal to the game, such as “find a key and escape” or anything…. Without that, why should anyone get interested enough to make a map that will play exactly the same as every other map? Of course, I had a creative idea to make a maze map, and it actually does have a goal, even if it’s as simple as “get to the end of the maze.” But it at least makes it worth playing to the end….. Though I actually think having a randomly generated city (as you’re doing in your new version) will be pretty cool…. And the gameplay tweaks are an improvement in this version. Though there’s absolutely no point in being able to Save/Load a game when there is no goal to work toward…. But whatever… don’t expect me to try to help you any more. I’ll just repackage the game myself with my graphics and map and put a link to it on the wiibrew page for people to download. don’t take it personally. He just is not into the whole collaboration thing and probably likes to have the simple arrows in the game. it often comes down to the amount of time it will take to put in the features. God, awesome game! But it need more gameplay. How about new weapons,items? !